Episode 41 Greek. 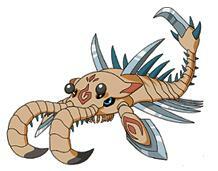 Anomalocaris is a crustacean from the Cambrian period. Octomon + Rukamon His second pair of eyes are radars to navigate the darkness! Has the power of "underwater"
Snimon + Win Ratio 40% He captures his enemies with the tentacles on his head and finishes them off with the blade on his tail!! Has the power of "underwater"
Once during the battle you can discard one card from your hand and make one of the opponent's Program cards ineffective before it takes effect.